The Fabulous Mary Stewart & Giveaway! 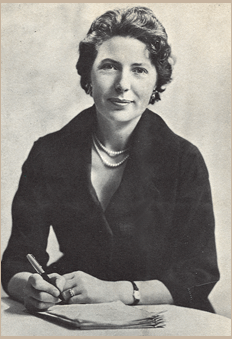 Do you remember Mary Stewart? An even more important question would be, of course, did you ever read a Mary Stewart novel? Those of us who are of a certain age – I would say over thirty – probably did read her, since her books were among the most popular of the romance genre in the late 50’s and then the 60’s and 70’s. In fact, many critics would say she’s one of the creators of the modern romantic suspense novel, that unique form of storytelling that blends a thrilling mystery with a solid love story. I discovered Mary Stewart’s books in my teens, when my big sister handed me a whole pile of them to read. It was love at first sight and I tore through them. Along with Victoria Holt and Georgette Heyer, Mrs. Stewart’s books inspired in me a love for the romance genre that ultimately prompted me to pick up pen and begin writing romance novels myself. And her books are beautifully written. One of Mrs. Stewart’s many strengths was her ability to incorporate setting into her books as a key element of story. Her settings are exotic and a reflection of her many travels around the world with her husband, Frederick Stewart. For instance, The Gabriel Hounds is set in Lebanon, This Rough Magic is set in Corfu, Greece, and the book I just finished, Madam Will You Talk? is set in the south of France. Her descriptions are so evocative and compelling that they blend seamlessly into the story, and enhance plot and character in a way that is unique to Mary Stewart novels. But why am I talking about Mary Stewart today? Several weeks ago, I received an email from a woman who works in the marketing department of Hodder and Stoughton, the venerable English publisher who has published everyone from Winston Churchill to Stephen King. Recently, they decided to reissue the books of Mary Stewart, who began her career with H & S and remains with them to this day. Since I had written a few posts about Mary Stewart, the marketing person with H & S asked if I would be interested in reading the reissues and posting some reviews. As you can imagine I was eager to say yes, and thanks to the generosity of H & S I now have several of the beautiful reissues of classic Mary Stewart novels to give away. And the books are gorgeous, too, lovely trade paperbacks with really cool retro covers. 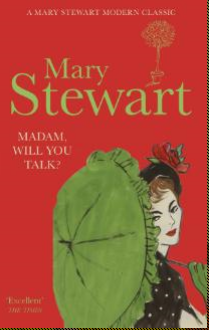 That’s the cover for Madam Will You Talk?, Mrs. Stewart’s first book, published in 1955. It was one of the few MS books I hadn’t yet read and I finished it last night. It blew me away with the quality of the writing, the intensity of the suspense, and the deeply realized character of the heroine, a young war widow who, while on vacation in Provence, stumbles upon a kidnapping and a murder plot. Madam also features two incredible car chases through the French countryside – the heroine learned to drive race cars from her husband – that were incredibly exciting and suspenseful. And how many car chases do you actually find in novels these days? MS totally pulls it off. Anyway, I’m thrilled to have the opporunity to introduce a new generation of readers to Mary Stewart’s classic romantic supsense novels. Today, I’m giving away a copy of one of my very favorite MS books, This Rough Magic. It takes place on the island of Corfu and the heroine, a British actress fleeing her failed career on the London stage, stumbles into the middle of smuggling ring and lots of danger and adventure. Oh, and along the way she rescues a stranded dolphin and finds the man of her dreams. It’s an absolutely awesome book. H & S also sent me several sets of beautiful postcards of these reissues, so I’ll also give away two copies of those to readers who comment. Just tell me who was the first romance author you ever read and you’ll have a chance to win the book or one of these great postcard sets. And if you have read Mary Stewart, tell me which book is your favorite!